Wedding flowers are a major part of the day for most couples: it’s one of the big questions you get from family and friends alike. Have you set the date? Have you got your dress? What flowers are you going to have? On top of that, they’ve undergone a major transformation: we’re lucky to live in an age of amazing florists (who you can search through on our directory) where we’re definitely not limited to roses and baby’s breath any longer. However many bouquets and arrangements you see on instagram, you may still be completely in the dark about the kind of figures they charge and what you can expect for that. Well, we’re here to help you with that – here’s our guide to the prices of wedding flowers. Less Blooming Hell and more Hell Yes, please! £80. The cheapest option is a hand-tied bouquet (perfect for a rustic wedding), as it doesn’t require intricate wiring from the florist and the flowers tend to have longer stems which are easier to manipulate. In contrast, a cascading bouquet needs wiring to achieve that gorgeous waterfall look and can add a significant amount to your budget! Want daily wedding inspiration, advice and tips? FOLLOW US ON INSTAGRAM! The season in which you choose to be married will have a huge impact on the price of your wedding flowers. Generally, prices rise around Valentine’s and Mother’s Days and certain blooms tend to be more expensive throughout the year, like peonies and Lilies of the Valley, as they are harder to obtain and don’t bloom all year round. Believe it or not, another factor that can affect your flower budget is the physical appearance of your chosen blooms! For example, flowers like orchids only have a two inch stem and will require a faux stem if you want to add them to your bouquet. 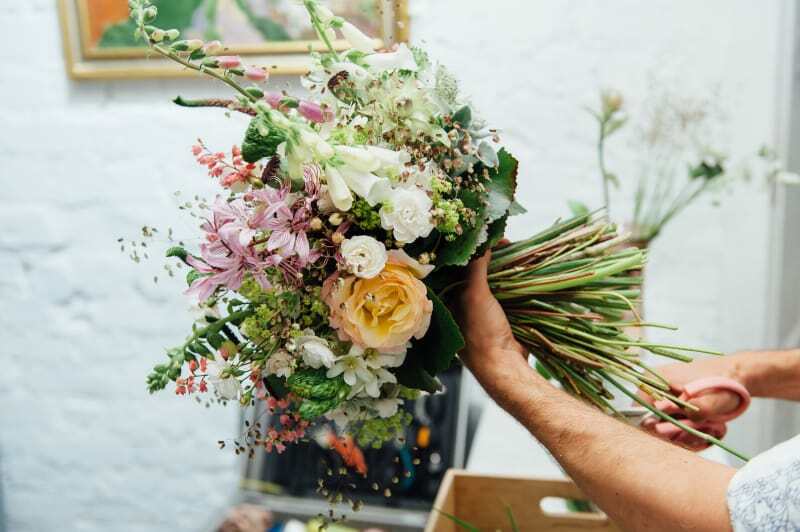 This is intricate work and the florist will charge you more for this, so if you want to save some pennies, think of flowers with natural stems which are easy to add to your bouquet! It used to be that silk flowers were considerably cheaper than real ones, however, new technologies mean that silk flower prices have almost matched and sometimes even exceeded the price of real blooms. On the plus side, though, they do look incredibly realistic. We recommend getting silk flowers if you are limited by weather, suffer from hayfever or want a permanent keepsake of your wedding day! If you do use fake flowers, be wary that you won’t get the benefit of the smell of the bouquet. Think about a floral perfume that you can use to still forever associate with your big day. The must-haves we recommend are the bridal bouquet, bridesmaids’ flowers (bouquets or corsages) and buttonholes for the groom and ushers. You can also add floral headpieces, table centrepieces, flowers for pew ends, flower displays for the ceremony and flowers for the cake, depending on preference.